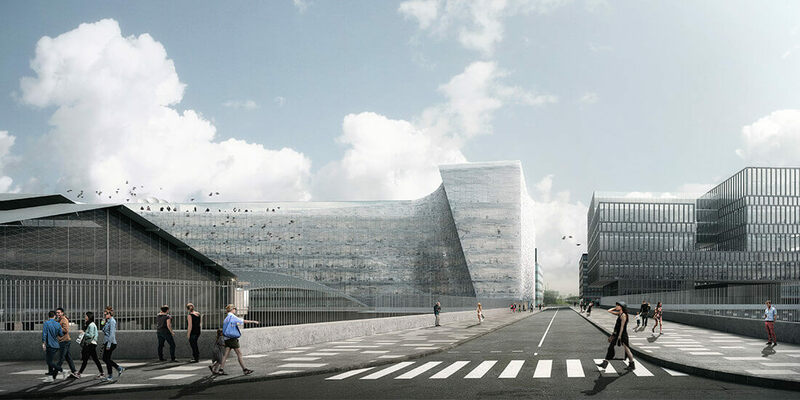 Snøhetta Architects designed the new Le Monde newspaper headquarters to reflect a unified Paris. Courtesy Luxigon and Snøhetta. Architecture is art that needs to work—sometimes, even, as a symbol. When the newspaper Le Monde was seeking a design for its new headquarters, Paris was reeling from the devastating Charlie Hebdo attack, and emotions in the city were raw. Le Monde was established after the 1944 liberation of Paris to be the new voice of France, and it again needed to stand up for unity. The commission was won by the Norway-based architecture firm Snøhetta, besting giants such as Renzo Piano and Manuelle Gautrand by emphasizing concepts of openness and transparency, strong aspects of Norwegian culture. Le Monde had asked for two towers with nothing in the middle because of structural constraints; Snøhetta proposed a bridge between the two towers that symbolized bringing people together. This innovative approach transcended the divisions that had bubbled to the surface in France—and clinched the commission. But although the artistic and social symbolism helped Snøhetta win the bid, the firm still needed painstaking scientific rigor to realize its design vision, which involved creating an intricate facade system. Håvard Vasshaug, an engineer who helped work on the façade, was part of a cross-disciplinary team including a facade engineer, architects, landscape architects, and interior architects. The building’s complex facade offers varying levels of transparency, connecting those inside and out. Courtesy Luxigon and Snøhetta. To integrate its many disciplines, Snøhetta uses a strategy called “transpositioning,” which essentially asks team members to switch roles to discuss a project. “If I’m an engineer, I’m going into a meeting thinking like an engineer, making engineering arguments, like gravity, gravity, gravity! Remember gravity, everyone!” Vasshaug says. But with transpositioning, team members put on different hats to think from another perspective, be it the design architect or the client. So in addition to gravity, engineers might consider what the building looks like from the street or what it feels like to work there every day. With this kind of cross-disciplinary collaboration, Snøhetta designed an intriguing building with a facade that elevates the aesthetics and is a marvel of engineering that offers varying degrees of transparency and pixelization. Learn about the software Snøhetta used to create the glass façade. The firm knows that design decisions don’t always reside in high-minded concepts but sometimes spring from mundane considerations, such as what will it be like to clean the building? “We thought about how people can clean the outer skin from the inside and what happens in front of the slab edge where you cannot clean the glass from the inside. It might become a little bit dirty because you don’t clean it as often. So we had to use different glass materials in the different areas of the facade,” Vasshaug says. Snøhetta set out to create transparency with its building, affording the people inside a brilliant view of the city and onlookers from the street a view inside the workings of the newspaper. “Where the French journalists are going to sit writing news stories, they are going to look outside and see Paris, see the city. 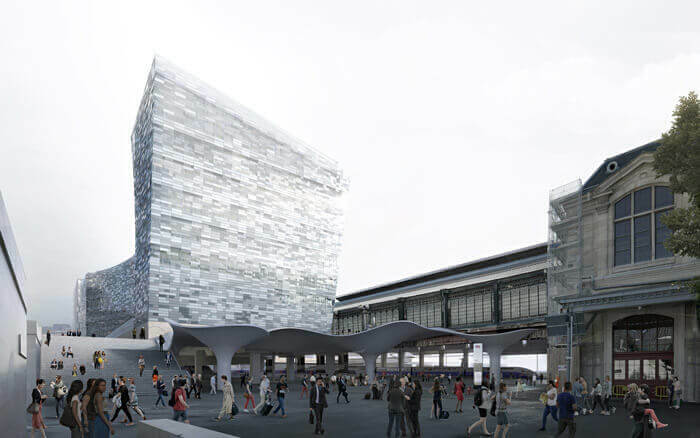 They’ll be able to see the Eiffel Tower from the fourth floor,” Vasshaug says. For optimization purposes, Snøhetta tried to use a minimal palette of materials to achieve the complex facade system. It used three or four glass panel types with varying patterns in combination with plastic films to achieve levels of translucency, transparency, and opacity. “So, you’ll have the same three or four materials in different combinations that come together to make the facade look like it has a random texture and pattern to it. And then in front of the floor slabs, there is a plastic film that obscures the guts of the building,” Vasshaug says. A bridge at the center of the building’s design suggests unification. Courtesy Luxigon and Snøhetta. To create the façade—the crux of its artistic concept of transparency and openness—Snøhetta employed a variety of technologies to achieve the random look of the patterns and differing levels of opacity. In addition to using virtual reality and 3D printing, the team created its own tools to achieve what it was after. “We approached the process by using computational methods, basically creating scripts that generate patterns based on our input parameters,” says Vasshaug, who used Autodesk Dynamo to create the scripts. For example, where the journalists work, they wanted to have 60 percent transparency, and where the floor slabs were, they wanted to have 0 percent transparency. “In front of the slab edge, it’s going to be 0 percent transparent panels, and to achieve this there would be a random pattern of opaque materials. So that is an input parameter. In front of the floor slab, to create some nuance, we wanted a 33 percent opaque panel and a 66.7 percent opaque panel with some translucent panels to bring them all together,” he says. Le Monde facade script iterations created in Autodesk Dynamo. Courtesy Snøhetta. The key to achieving the desired effect was not to rely exclusively on technology or to abandon human intuition: The random computer-generated pattern was subjected to the artistic eye of one of the firm principals in a full-size section mockup on site in Paris. 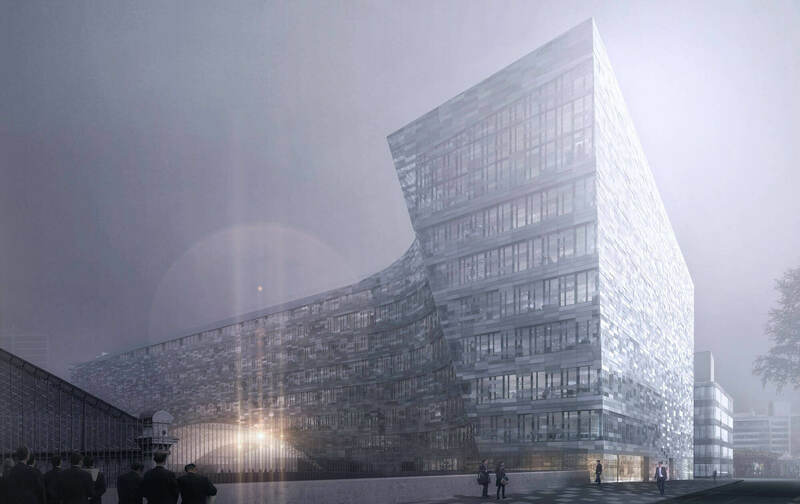 Kjetil Trædal Thorsen, the cofounder of Snøhetta, viewed the mockup and expressed concern that the vertical lines between panels were too strong, diminishing the random effect that the team was going for. And then it was back to the drawing table (or rather the programming table) with Vasshaug and Luca Bargagli, the Italian facade engineer. They worked together to change how the script would generate the random patterns to better align with the aesthetic intent. “So you go in and change the way the script behaves based on the input from designers. You change the parameters, execute it, and watch beauty unfold,” Vasshaug says. By bridging the divide between art and science in its work so beautifully, Snøhetta was able to design a transcendent building for Le Monde in the hopes of heralding an era of openness and transparency that bridges the divisiveness of the modern world. And even if this lofty goal isn’t achieved right away, at the very least, Snøhetta has created a wonderful space to work for the staff and a building that enhances the fabric of Parisian society.